Attractions: Poconos Riding Stables, horse back, etc. 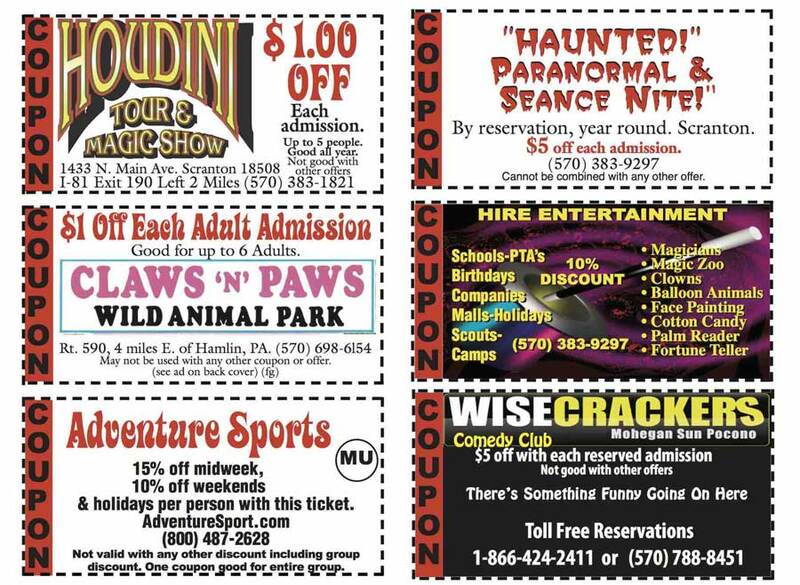 Here are some of the best coupons and discounts for attractions in the poconos, & pocono mountain region. New service!!! We can now help you make your reservations, & plans online and help you make your choices. CLICK HERE NOW! Go to Discount Coupons for Pocono area. Go to Houdini Museum, Scranton, PA.
© 1989-2003 by magicusa. Except for reviews, no part of any of this document may be reproduced in any form, without written permission by the authors. The graphics have been retouched, computer enhanced and resized by the authors. � by magicusa. Except for reviews, no part of any of this document may be reproduced in any form, without written permission by the authors. The graphics have been retouched, computer enhanced and resized by the authors.